Hope you didn’t miss it! The room was packed…some of our poets with aphasia were nervous, some didn’t even tell their families that they were going to get up and speak. Our Poet Laureate of St Petersburg, Helen Wallace, started us off with a compassionate reading related to her own family experience of stroke. Check out photos of this exciting event. Then came our poets with aphasia…one by one, some in pairs, supporting each other, laying it all out there…what they wrote, what they felt, how they could present in front of such a large audience. After every reading, a huge cheer rose up out of the audience. Success! You wrote something you didn’t think you could write, and you stood up in front of everyone and presented it when you didn’t think you could! Amazing! We capped off the evening with Mike and Kathy Caputo honoring the Co-Founders of the Suncoast Aphasia Support Group. Then Florida’s Poet Laureate, Peter Meinke, took the stage. The first thing he did? Read a poem that was written by a poet with aphasia. The silent auction featured paintings by people with aphasia, and paintings by local artists who dedicated their work to Voices of Hope for Aphasia, along with many other wonderful items. If you had to miss this great event, it’s not too late to be a part of it. By donating now you recognize that people with aphasia have got talent! 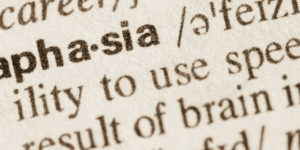 Thank you for being someone who cares about the 2 million people in the U.S. living with aphasia – and their families!